The pressure vessel base of the VVER-1200 reactor for unit 1 of Turkey’s Akkuyu has been manufactured by Atommash in Volgodonsk, Russian state nuclear corporation Rosatom said on 8 February. Russia is building the Akkuyu plant on a build-own operate basis for Turkey. Atommash is the Volgodonsk branch of AEM-technology, which operates within Rosatom's machine-building division of Atomenergomash. The entire manufacturing cycle for an Atommash pressure vessel takes around two years. Atommash said that production of the bottom section was carried out in two stages. First, a forged steel blank was cut from a pipe. It was then heated in a furnace where under pressure of the press it was unbent into a metal sheet. In the next stage, the bottom was drawn-out. 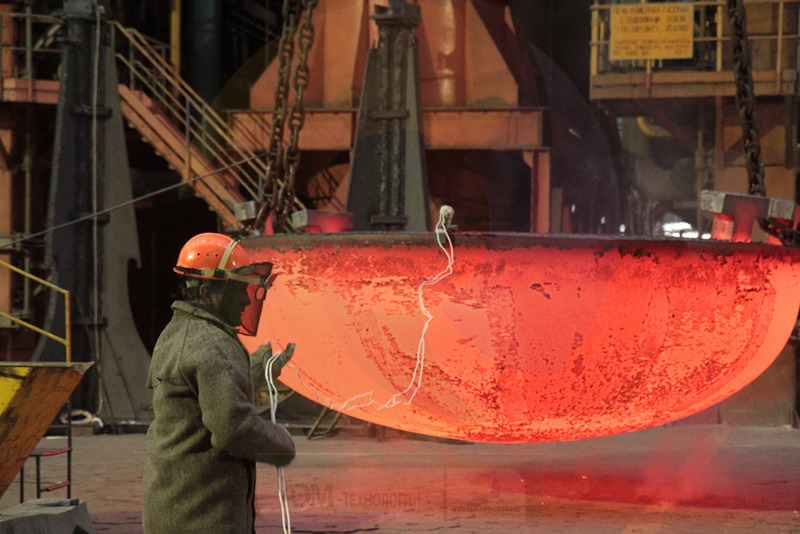 The blank weighing 64t, 5850mm in diameter and 300mm thick underwent two-stage heating in the furnace at a temperature of 1040 degrees Celsius. The sheet was placed in the die tooling machine and the bottom was stamped with a press power of 12000 ton/forces. Finally, the finished bottom was put back into the furnace for heat treatment to relieve residual stresses in metal. This operation will last six days, with heating and cooling alternating within a temperature range of 600-900 degrees Celsius. After cooling in air, the bottom will be inspected. In September 2017, the Turkish Atomic Energy Agency approved AEM-technology as an equipment manufacturer for the Akkuyu nulcear plant. "While manufacturing equipment for the foreign customer we must comply not only with Russian norms and rules for NPP equipment, but with national standards of the country, where we supply our products," said Atommash director Rovshan Abbasov. Atommash, which mainy supplies export markets, delivered a set of steam generators for India’s Kudankulam nuclear plant October 2018.